Good thing no baseball purists will ever see this. Their seamy-heads would get all steamy-headed. Voting for the Major League Baseball All-Star game is underway. With just a few weeks to go, preliminary voting results for the American League and the National League have been released by Major League Baseball, leading to the annual hand-wringing of purists who bemoan that fans are – gasp! — voting for their favorite players, not necessarily the most statistically accomplished ones. Go ahead, call me Stupid. 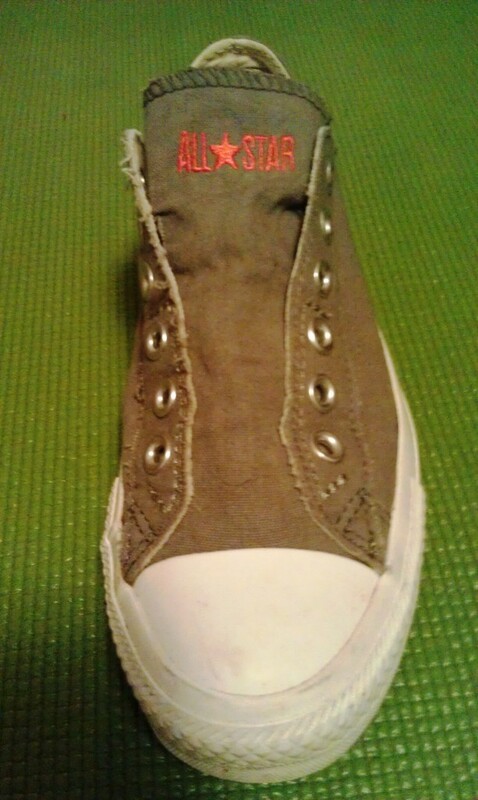 I may be Stupid, but my shoe thinks I am an “All Star,” too! I vote. I vote online (35 times, which is what they allow). I scoop up a few extra ballots at the games, take them home, punch the chads, and send them in. And, I admit it, I’m not voting for players based solely on statistics. There are plenty of awards given for accomplishment in baseball – MVP, Cy Young, Silver Slugger, Gold Gloves all recognize personal achievement. Trophies (and paychecks) galore! But, for me, being a good sportsman, a good representative for your team, and other “nice guy” attributes elevate you to “All” Star. The Baltimore Orioles, as always, are MY All-Star team. Orioles are League Leaders in many categories, including home runs (Chris Davis), doubles (Manny Machado), and team fielding. Yay! I’m sure your favorite team has sweetened the voting pot. The Baltimore Orioles are offering discounts on tickets to online voters. They’ll even enter you into a contest to win an autographed Orioles All-Star jersey. Baseball’s just a game afterall. And, it’s played for the fans. (That’s why they invented bleachers and Bobblehead Giveaway Nights.) You’re darn right, we deserve a vote. But, don’t worry, Purists. We Stupids won’t ruin it for you. The All-Star game will be filled with worthy players, just as it’s been since 1933 when Babe Ruth homered in the very first one. Every team will have at least one player there. Eight percent of baseball’s 750 players will wear an All-Star jersey this year. We “Stupids” only vote in the starting lineup – a mere 26 percent of the 68 players who will make the trip. Players and managers will choose the vast majority of the roster, including all of the pitchers. The deserving players will be there. Fans have been voting for baseball’s All Stars since 1947, more or less. Baseball took away fan voting after Cincinnati Reds fans – in cahoots with their local newspaper, Kroger Grocery stores, and neighborhood taverns – brazenly stuffed the ballot box in 1957. Fans got their right to vote restored in 1970. If you want to vote for a player because he tossed a foul ball to you up in the stands, or signed your nephew’s cap, or takes part in community service programs in your city, do it. I don’t think your vote is going to deprive the Tigers’ Miguel Cabrera or the Reds’ Joey Votto from going to the game. An All-Star is much more than a line on a box score. After all, nearly every single purist and odds-maker crunched the numbers last October and predicted with absolute certainty that the Detroit Tigers would win the World Series. The SF Giants swept ‘em, by the way. So, who’s Stupid now? The All-Star game on July 16 also means something – since 2003 the winning league gets home-field advantage in the World Series. This entry was posted in Baltimore Orioles, Baseball, Baseball History and tagged All Star Game, Cincinnati Reds by Jackie, The Baseball Bloggess. Bookmark the permalink. I just joined the ranks of the “Stupid” — Go Orange! One thing I have never liked is the “there must be one player from each team on the roster” rule. If a team isn’t deserving, what’s wrong with leaving that team off that year? OK, I’m torn on this one. After all, I’m an Orioles fan, and if it weren’t for the “every team gets at least one spot” on the roster there would have been many many empty years for the O’s. But, you make a good point. Still, I think that sometimes we miss great players because they’re playing for sub-par or unnoticed teams — surely, every team must have one all-star caliber player on their roster. Shouldn’t they? I know that fans play favorites when they vote, and I know that the managers who will skipper the All-Star teams do as well … maybe forcing them to include a player from every team brings a little more parity (and will avoid Bruce Bochy from, say, just filling up the remaining slots with his Giants this year … for example). This year I watched the entire US Open and several ENTIRE yankee (home team) Indian hubby’s home team) games. (Not with each other though!). Love these posts. I am torn on this issue also, but I think it is good for kids to see someone on “their” team be on the all-stars.